Ask fellow campers about "Peaceful Valley Campsite" and nearby attractions. Very beautiful setting with river running along the boundary. Service is lackadaisical, but tolerable. I have stayed here every Summer since 2009 for a few days. I go to the area to ride my motorcycle on the nearby back roads. We camped at Peaceful Valley Campsite in a Travel Trailer. I've been camping for over 30 years & haven't seen a business in such a disorganized mess. Website is horrible; can't pay or reserve a site. Send check thru the mail. I found out I was camping when they cashed my check a month later. I reserved a cottage & 2 FULL hookup sites. Price on webpage is different to actual. The owner couldn't care less. I checked in for my RV site - no site# or map. He pointed to another customer buying ice & said 'you're near him follow him back to his site'. When my friend checked in the 2nd RV he was told pick ANY site at river. When he picked next to me, another camper said they were 'saving' it & the owner knows. The owner was called & came down, he forgot about the 'saving' site & told my friend to move his camper to another site. He THEN informed me, I had to share MY sewer with another camper. I was PAYING for full hookup. My family checked into the cottage it had mouse droppings inside. They were given glue traps & caught a mouse. Also a propane gas leak in bath. Another couple renting a small cabin had mouse droppings on the sheets. they also caught a mouse. If you pay for lodging it should be mice free! NO family activities. NO pool. Then the power went out. For 2 days of the 3 day weekend. NO communication. He never came around to see if anyone needed anything. No power = No water. We used the cottage for showers/toilet. When power came back, late on last night, nothing left to do except sleep. Morning came, all I wanted was to dump my tanks & leave. After packing, I opened the black. In 5 seconds sludge started to bubble from the ground. It was backed up. I didn't use the sewer the whole weekend we used the cottage bathroom. I found the owner. Instead of helping, he said to dump the crap on ground & he'll deal with it later. I was so disgusted I payed for 3 days full hook ups & not having any. He could care less & gave me $10. I went back & dumped my crap on site & smiled at the thought of him cleaning it up & paying me $10. We camped at Peaceful Valley Campsite in a Travel Trailer. Don't camp here if you expect cherry helpful people. If you want to be left alone to hunt, fish & get drunk; then you should be ok. If renting cabins/cottages must deal with rodents. Very loud park with parties. The fireworks store never open. However it's beautiful location. 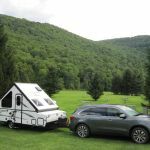 We camped at Peaceful Valley Campsite in a Travel Trailer. I need to preface this review by saying that we were at Peaceful Valley Campground for the NEAT (Northeast Electric Aircraft Technology) Fair. This is a one-a-year event for electric model aircraft. It’s the largest event like this in the US and, and more than likely, worldwide. There were 374 registered pilots and over 1,000 visitors and hundreds of campers. The area is beautiful having the campground nestled in a valley. It’s also huge. The management did a good job getting everyone to their site. Extra help was hired to keep the bathrooms clean although there were some shower issues. One evening I tried 5 shower stalls until I got one to work. Either the coin receptacle was jammed or the timer started but no water came out of the faucet. Overall, the bathrooms are fine with the nicer one near the office. Due to the valley, cell phone connection is iffy. There’s no internet connection although if you try to link up you can see the service for “Peaceful Valley Aerodrome” but you need the pass word to enter. When I checked with the office, the gal stated that that is the connection for the house. I don’t know why Arnie doesn’t offer WiFi. I guess we’ve just gotten accustomed to it at campgrounds, either free or for a charge. Now, if you want to just go there to camp don’t try to find a site map on the website—there isn’t any because there are no sites as we campers expect to see. Instead, there are rows of hookups-water, electricity and sewer. Campers park along these rows, nose to tail and fairly close side to side. For the event we attended, that was fine but for a camping vacation—no go for us. Of course, with the campground as large as it is you probably wouldn’t have someone near you unless it is a very busy weekend. We camped at Peaceful Valley Campsite in a Tent Trailer. Are you affiliated with Peaceful Valley Campsite ?